After several months of silence, it's good to finally see this piece complete and online. The main challenge was to put together the natural sound with plain acoustic recordings, and a good balance through the whole series of different parts. It's also the first piece here with a violin, and if it's quirky then blame the guitarist (same person!). The title literally means "two people's light and darkness". 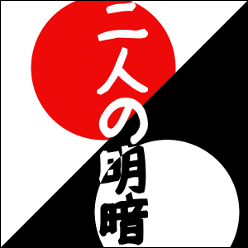 This is based on a Japanese idiom involving the word 明暗 (meian) which means light and darkness at the same time: 明暗を分ける (meian o wakeru). This translates word-by-word as "to separate light from darkness", which basically means to decide someone's fate or the outcome of something. The title of this piece doesn't actually contain this complete idiom so it leaves the two people's fate undecided. Then although there isn't a proper story, there are a few general elements that give it the sense of a progression and that something is happening. For example, it could start at dawn when the Sun rises, then end up at night with the Moon. It also suggests that two characters meet and move about, following the violin and the bass, while the environment (mainly the light) changes with the guitars. About the instruments, there is an electric bass with flat-wound strings to produce a soft sound, two Spanish electro-acoustic Alhambra guitars played with a plectrum quite close to the bridge to sound a little bit like a Koto, and a violin with plain gut strings for the warmth of the sonority and the accents. The same harmony repeats itself several times with changing arrangements to create a progression through different phases. Finally it is dedicated in memoriam to Suzy, who was an amazing person and a great influence to me, and for the work involving the Japanese language she asked me to do when we met. I first dedicated it to her in 2011 although it wasn't complete at the time; that was shortly before she sadly passed away.